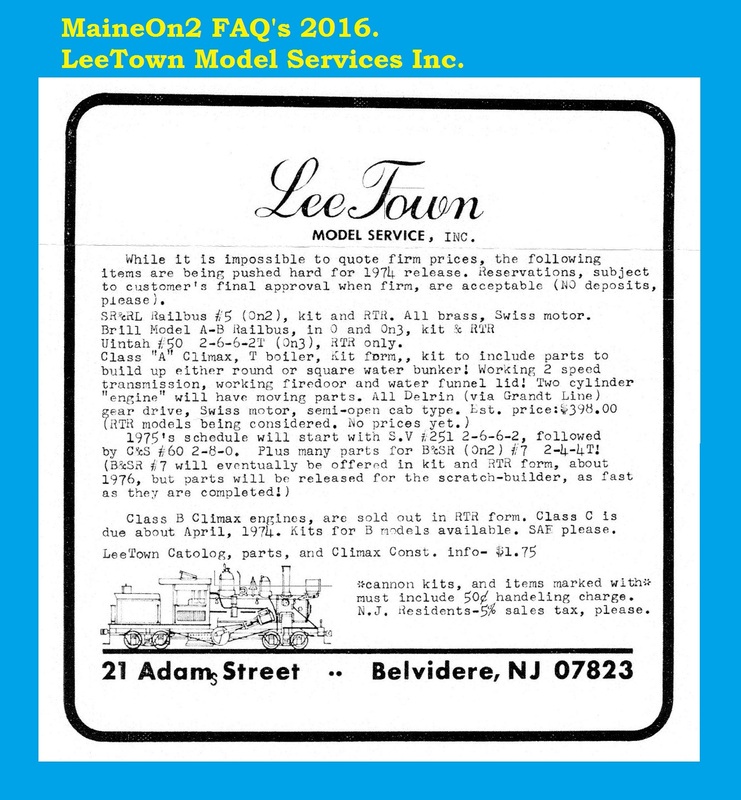 LeeTown Model Service, Inc., an early supplier, circa 1969 – 1974. 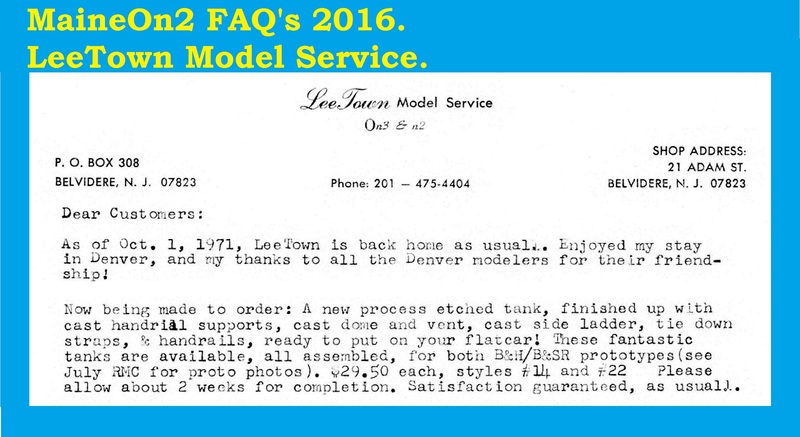 LeeTown Model Service, Inc. is the trading name adopted by the partnership of Lee Snover and Darryl Townsend for their professional modeling activities. As a trading enterprise, LeeTown specialised in Narrow Gauge Railways, Geared Locomotives and high quality (Micro-motor) transmissions. From the 1970’s onwards, they were well known for their On3 Climax locomotive parts and kits, but they also played a significant role in the commercial development of Maine On2 modelling. LeeTown have always traded from a Belvidere NJ address. Darryl Townsend moved away from this area, and produced some models under the Town Models banner in Illinois. Click here to view the Town Models topic. Darryl Townsend, Lee Snover, Charlie Brommer, John Derr, and I were all charter members of the Mid-Atlantic Narrow Gauge Group that Don Brown brought together nearly 50 years ago. We would gather at Don’s house in Summit (NJ) every month to share ideas and interests. We quickly became a production group, though, working together to produce drawings, kits, parts, and finished models. Darryl was teaching obstetrics at Temple University in Philadelphia, but later moved to Chicago. Lee and Charlie continued on their own. John and I collaborated on drawings for 20 years. Those were very active years for the two-foot community. 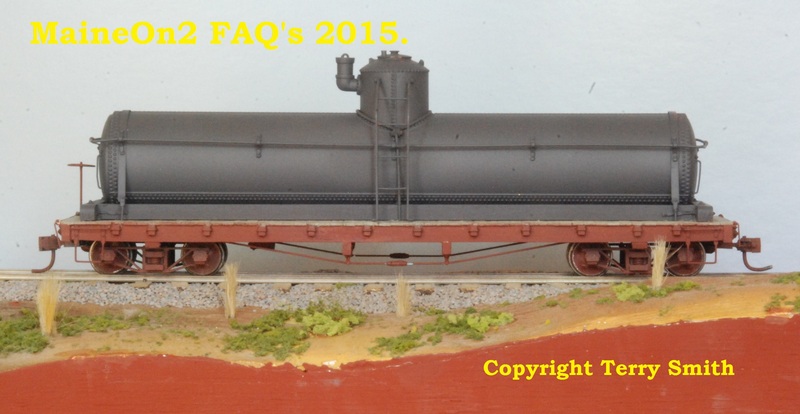 Terry Smith wrote;- I did acquire Wes’s model of tank #22 via Bob Werner of the Hobbybarn, see below. 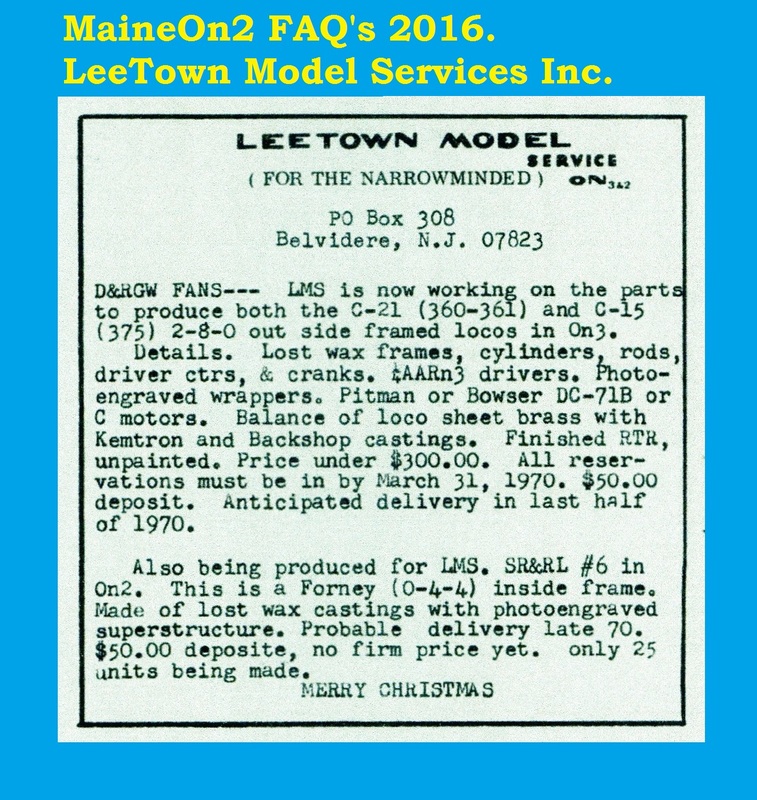 Editors’ note; the heyday of LeeTown’s activities in Maine On2 (circa 1970 -75 or so) predates my own exposure and interest. LeeTown also had their own approach to advertising by using a mixture of formal display adverts in the Narrow Gauge modeling magazines, which sometimes included future plans with invitations to write in for more info, or statements such as more info in new catalog and the occasional “snippets” and pictures of new parts released to columnists and reviewers which were used in Editorials, mixed in with occasional use of classified adverts. Looking through the old issues of the Narrow Gauge modeling magazines these days, it is not that obvious whether some of the parts mentioned were made by LeeTown themselves or whether they were acting as retailers, and whether the items actually ever appeared (see the update below for further information). November 1969 Finelines: advert suggesting that a batch of 25 SR&RL #6 models was in process for delivery in late 1970, $50 deposit to reserve. September 1971 Finelines: editorial and advert about the new process B&SR/B&H Tank Cars. January 1972 Finelines: editorial about the SR&RL #6 and Forney superstructure etches. March 1973 Slim Gauge News: editorial showing On2 swing motion trucks (as used under the B&H tank cars) complete with brake beams and Grandt Line wheelsets. These could be parts supplied by SRECo. March 1974 Finelines: advert offering SR&RL Railcar#5 plus future plans for a batch of B&SR loco #7 for release in late 1975 or 1976. September 1974 Finelines: LeeTown featured as a parts supplier in a Hobbybarn advert announcing the CB SR&RL #6 and offering an alternative set of parts for the home constructor. SR&RL #6 in On2 RTR? This is the advert from the November 1969 edition of Finelines magazine which introduced the SR&RL #6 model. SR&RL Railbus #5 in kitform + RTR & future B&SR loco #7? This is a cut-down copy of the advert from the March 1974 edition of Finelines magazine which offered SR&RL Railbus #5 in kit form and RTR and which also announced future plans for a batch of B&SR loco #7 for release in late 1975 or 1976. This Hobby Barn advert from the September 1974 Fineline magazine lists LeeTown as a supplier “………..for those who wish the challenge of constructing the engines themselves…….”. People who knew Bob Werner would not find it hard to imagine the smile on his face as he wrote those words. In the context of this blog and this post, Narrow Gauge modeling magazines refers collectively to Finelines, Slim Gauge News and the Narrow Gauge and Short Lines Gazette. These are now available on DVD from Bob Hayden. Click here for more information. All adverts from Finelines and the Narrow Gauge and Short Lines Gazette magazines appear by kind permission of Bob Brown, Editor and Co-owner.